The Gay and Lesbian Alliance Against Defamation will recognise video games in its annual media awards for the first time in 30 years. GLAAD’s first Outstanding Video Game award has lined up five games it claims are noteworthy for queer inclusion. That list is comprised of Assassin’s Creed: Odyssey, The Elder Scrolls Online: Summerset, Guild Wars 2: Path of Fire, Pillars of Eternity: Deadfire and The Sims Mobile. Most, if not all of these games have been named for including prominent queer characters or relationships. Full descriptions of why each nomination was chosen can be found on the GLAAD blog. 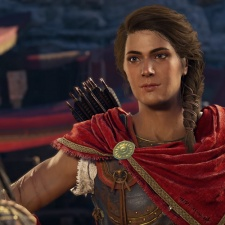 Assassin’s Creed’s nomination comes with an additional blog post explaining GLAAD’s choice, following controversy over Odyssey’s DLC removing queer agency. “Ubisoft has publicly apologised for the acknowledged mistake, and since last week, GLAAD has been in direct contact with Ubisoft in an effort to work together to improve aspects of this DLC and future content releases,” said GLAAD gaming specialist Blair Durkee. “The changes do not entirely solve the challenge, but we believe those changes are a good faith effort and a solid first step. GLAAD thanks Ubisoft for their apology and their commitment to do better." The list is notably missing much of the undersung queer games scene in its nominations. While this is the organisation’s first foray into gaming, it would be nice to see it platform smaller, queer creators in future rather than triple-A games attempting representation.